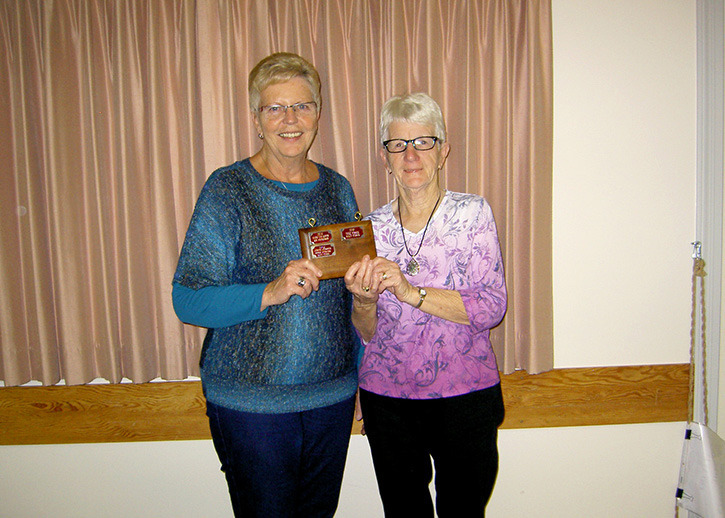 The Port Alberni lawn bowling club gave members trophies and elected a new executive board at their AGM on Oct. 13. A newly elected executive board was named during The Port Alberni lawn bowling club’s annual general meeting (AGM) on Oct. 13. The new team includes president Nancy Hemmingsen, vice president Derek Burke, secretary Allison Merryfield and treasurer Elaine Van Kooten. Trophies from 2016 were also awarded to members of the lawn bowling club at the AGM. The Club Lady Single went to Elaine van Kooten, the Club Men Single went to Stephen Forrest and the Club Pairs went to Jake and Elaine Van Kooten. Neal Wilson won Men’s Novice, the Red Sox Triples trophy went to Rinnie Hoekstra, Alice Vissia and Jr. Johnston. The Joe Trail Memorial was awarded to Fred Hanson, Rinnie Hoekstra and Maurice Bernier. The District Lady Single trophy went to Robin Forrest, the District Men Single went to Stephen Forrest and the District Pairs went to Stephen and Robin Forrest.